You’ll discover new hacks that you’ve never heard of, you’ll come across some golden oldies and you’ll find some that may cause you to raise an eyebrow or two. ‘120 Greatest Anxiety Hacks’ is guaranteed to be the very thing you reach for when needing a quick reference to a tip or hack to reduce those debilitating anxious moments! Do you suffer from anxiety? Are you looking for some tips to help you lead a happier life? If so, then you need to take a few minutes to join Mel Bonthuys and me as we look at some hacks to reduce anxiety. Mel, why did you want to write this book? I wanted to provide a simple and fun tool with many anxiety hacks all in one place that would be easy to use in times of anxiety and stress. How did you come to have a collection of anxiety and stress hacks? I was a diagnosed anxiety sufferer in 2009 and have suffered with anxiety since 2001. Only recently have I truly recovered. I’m sorry to hear that you’ve suffered from anxiety from such an extended period of time, but I’m very glad that you’re doing much better now. I’m sure your recovery has greatly influenced what you wanted to share with your readers. What was the most important thing that you wanted to share with them? Anxiety sufferers need to know that they can recover. Looking back, do you feel that sharing this message of recovery with readers has kept you energised as you write, or do you find yourself exhausted when it gets sad? It depends. I write on mental health, which can be sad when thinking about how many people suffer with mental illness, but it’s exciting when I write about how people can and do get over mental illness, and I’m happy to be able to share it with so many people. What do try to keep at the forefront of your mind so that you can share your wisdom with others? The truth and a little humour. I’m glad that there’s a little humour there. I’m sure it makes writing so much easier. As you’re now in a healthier state of life, do you feel that there are more books in you waiting to be shared with the world? Do you have anything in the works? Building a course would be a lot of fun! Good luck with it. Now, you also mentioned a third book. How has your writing changed now that you’ve finished two books, and are progressing through your third? I’ve realized that it’s okay to be who I really am as a person. I’m glad you’re happy to be who you are! Is there any advice that you’d give to fellow authors who are looking to reach that feeling of being okay as people? Or do you have any general tips you’re burning to share with authors? Do a course! You may not think that you need any guidance or help, but trust me, you do! Especially when it comes to promoting and marketing your book. I have been exposed to SO many things that I never even knew existed! When you start to dig into the world of writing, you find out it is HUGE! Working your way through a course is a great way to get guided through all of those things that you didn’t know before. We’ve worked through most of my questions, but I have a few non-writing ones that I’d like to ask you to see if the readers and I can find out a few things about you that we didn’t know before. I’ll start with an easy one. What is your favourite word? That’s a great one! I love a little cross-language application of words. Let’s keep cross-pollinating ideas with my next question, what happens if Batman gets bitten by a vampire? He’d permanently change into a bat. Oh, that doesn’t sound good for Batman. But you never know, he might be better off! Mel, we’re just about reached the end of today’s chat, but before you return to building that course, can you share your favourite line from ‘120 Greatest Anxiety Hacks’ to create a little more enticement for those who might be a little unsure about getting some hacks into their lives. So very true. Mel, thanks so much for sharing a little of the life around ‘120 Greatest Anxiety Hacks’, and I hope that you’re able to share the hacks with those in greatest need. Excited to read the book we discussed today? Find it here on Amazon: ‘120 Greatest Anxiety Hacks – Some old, some new, and some truly unorthodox ( ASIN: B07DGY7Z66 )‘. 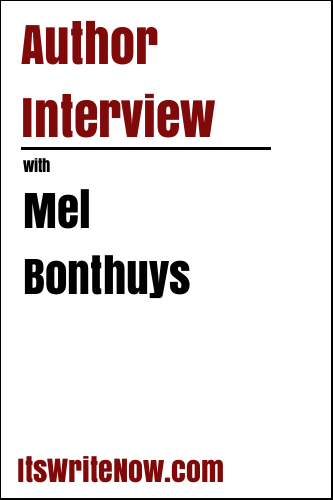 Want to find out more about Mel Bonthuys? Connect here!